I just finished ordering this elegant design as a tote bag and, for my special pleasure, a gift card of the fascinating elephant. Thank you for your incredible, stunning creativity. So it was you! Thanks so much. I’ve just tweeted about those sales. I’m so delighted! I love that mysterious sepia pier, and the elephant is a masterpiece of mysterious power. I shall quote you! By the way, I lost you for a while as WP was unfollowing blogs on my behalf – so helpful. I have noticed that some people are not getting through to me. I hope WP has not unfollowed them. I hope not but I know others have had the same problem. Happy Weekend! Thank you for sharing. Your site is an aesthetic learning experience. I absolutely LOVE this–but I adore everything you post! What a sweetheart you are, Catherine – thank you so much! I just shared your site with a friend of mine who is photographer. She’s great at sharing tips, too. I plan to reblog others’ sites once a week. If you have a favorite post from your site, let me know. I really loved this. I can see why you like it! Thank you so much, Syd! LOVE THIS! You’ve added a gorgeous moody atmosphere to this. It’s haunting and sad – and yet, because it still stands, it’s almost hopeful. You can almost see the ghosts of decades past. Thanks for the mention, Sarah. I was told one should include a call to action in your posts, so there you are. I agreed, I also think it’s Brighton Pier (I studied at Sussex and even lived in the seafront for a year). I haven’t been there for a few years, but unfortunately not much left of it now. It is gorgeous. I’ll check the site too. If you think so as well, let’s say it’s definitely Brighton! I love piers and too many have been destroyed by fire or allowed to disintegrate. Crying shame. I did! Thanks so much, Joanne. Gosh, I’ve run out of words other than just a plain thank you! i didn’t know about that site-unsplash- but have bookmarked it now! thanks sarah. It really is a fabulous site. Thank you very much, Anne, for finding it ‘superb’. I have a grin on my face! I really like that pier – but I don’t know why. What is it about that shot that keeps your eyes focused on it? I’m very happy to hear that! I think it’s the detail of the denuded structure that keeps one focused. There’s something so heartbreaking about a once grand edifice. Ah, heartface, thank you so much! 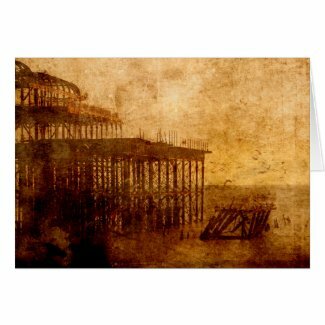 That looks very like the ‘West Pier’ here in Brighton and Hove, which caught fire many years ago. Some parts of it are still standing, but mother nature has claimed most of it now. It looked very like the West Pier to me too but the infuriating thing about Unsplash is that they don’t give those sort of details. Not to worry, Sarah. It’s a lovely design and beautiful item. And thanks so much for the compliment! You’re welcome Sarah. I’ve been there myself in not being able to find out information and know how frustrating it can be. I’m pretty sure though that it is the West Pier in Brighton. In which case, I shall add Brighton and Pier as keywords. « First Night Design | EXTENDED—Redbubble Special Offer: 1 Day Only – 20% Off!